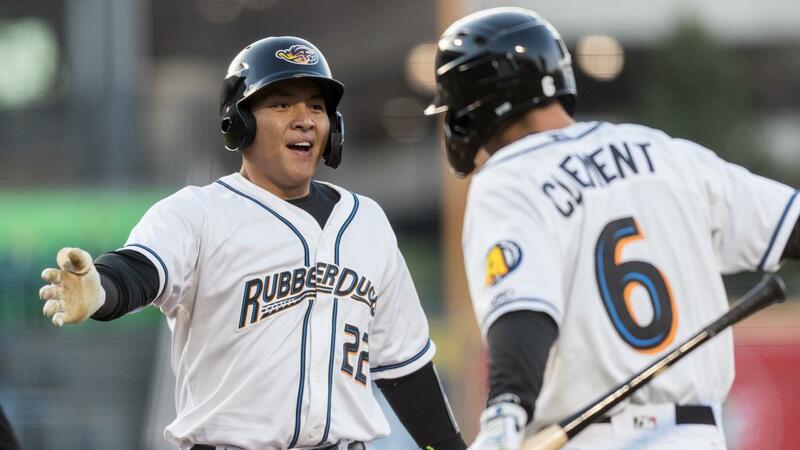 Two Akron RubberDucks' unearned runs in the fourth inning snapped a 2-2 tie and gave Akron a 4-2 lead and its first win of the 2019 season, 5-2, coming against the Trenton Thunder on Wednesday at Canal Park. With the game tied 2-2 in the bottom of the fourth and runners on first and second, Akron shortstop Ernie Clement hit a shallow pop-up behind second base, which was dropped by Trenton second baseman Wendell Rijo. That scored Andruw Monasterio , who reached on a one-out double, and sent catcher Li-Jen Chu , who walked, to third base. Designated hitter Mitch Longo followed Clement with an infield single up the middle behind second base to score Chu and make the score 4-2 RubberDucks. Akron starter Jake Paulson picked up his first win of the season, allowing two runs on six hits, walking two and fanning three over six innings of work. Argenis Angulo and David Speer followed with scoreless innings of relief and Dalbert Siri fired a scoreless ninth inning to earn his first save. Trenton starter Trevor Stephan went 3.2 innings, allowing four runs (two earned) on six hits, two walks and he struck out four. Nick Green relieved him in the fourth and pitched the final 4.1 innins, allowing one run on four hits, walking one and fanning seven. Akron had 10 hits on the night, led by Longo's 3-for-5, 1 RBI, 1 SB effort. Chu went 2-for-3 with two runs scored and a pair of runs batted in and a walk. Chu drove in Akron's first run in the second with a run-scoring double to left. Connor Marabell had a pair of singles and scored two runs, and Monasterio had a double (1-for-3) and a run. The RubberDucks finished the homestand 1-6 and head out on a seven-game road trip at Altoona and Trenton starting tomorrow night…Monasterio's double extended his hitting streak to five games (8-for-20, .400)…Time of game: 2:59… Attendance: 1,803. The RubberDucks start a seven-game road trip at Altoona and Trenton tomorrow. They take on the Curve at at 6 p.m. tomorrow. The game will be broadcast on Fox Sports 1350 AM, the WARF iHeart channel, and the TuneIn Radio App.